Delicious Swedish lingonberries are loved by millions! Perfect with meatballs, pancakes, waffles, toast and more. 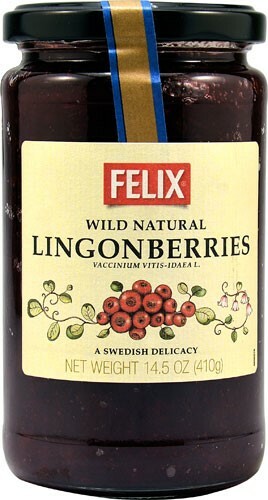 Ingredients: Wild lingonberries, sugar, water, fruit pectin. Calories 70 - Total Fat 0g - Sodium 0g - Total Carbohydrate 18g - Fiber 1g - Sugars 17g - Protein 0g.